It's t-shirt ordering time. In this reminder we discuss why it's important to give yourself plenty of time to get your orders submitted way in advance and how to avoid having to make those last minute t-shirt size adjustments that can delay the whole distribution process. If you haven't completed the design, ordering and organizing of your family reunion t-shirts, now is the time to do so. Organizing t-shirts is no small task. First you want to design it. Then order one. Let the reunion planning committee see the finished product first. After they all have a good look at it and give feedback you'll have time to make the needed changes. Next start collecting orders and fees for the shirts. Finally submit the order. As you can see this takes time. At this time T-shirt designers offer discounts to increase off-season sales. In addition discounts are added to bulk orders. The savings can be phenomenal. Don't be fooled by low budget t-shirt offers. Frankly some of these shirts smell of low budget ink. Others are then, hard and poorly sewn together. Your best option? Go with the t-shirt designers who are highly rated by reunion planners like us. An ideal tool to get it all done is the Family Reunion T-shirt Roster. It helps you keep up with fees, payments and distribution. The Roster is part of the web app package our reunion event planners use when organizing their shirts. It's also part of the family reunion planner spreadsheet found on the reunion planning web app interface. There's nothing worse then being told that the t-shirts sizes you ordered are too small or too big. The hard facts are people grow and shrink and get thinner or wider over time. Encouraging younger folk to order a shirt one size larger or smaller may seem to be the solution. But that depends on the changes taking place in each individuals metabolism. The real solution? Once you've completed your t-shirt design share it with all attendees using the share feature on the t-shirt designer tool bar. Each household can order them personally and if the shirt does not fit they can order another one as needed without having to contact you. You can even set the price for your shirt and and sell it your self, adding the proceeds to the family reunion treasury. Fimark's Family Reunion Planner Social web app has the t-shirt designer, pre-designed t-shirts and the reunion spreadsheet to get your t-shirts designed, ordered and organized in no time at all. Get Fimark's Family Reunion Planner Social web app from the profiles link on this blog page. Last month we gave recognition to individuals and groups who made significant contributions to the world at large with regard to freedom from slavery, lifting racial barriers and upholding freedom of religion. We awarded creators and designers of beautiful genealogy presentations. This month we took the time to thank artists and entertainers and movie producers whose work help promote family values, social skills, good work ethics and community responsibility while providing unforgettable quality entertainment. In this case we were taught these basic principles while being entertained in a very warm and personable way. Here are a few messages left on their Facebook pages. Some say you are what you eat. Others say you are what you read. We say we are what we celebrate most. Thanks for sharing and celebrating every moment of family life with us. Because of you thousands are reminded to "Put Some Love In It." Family that is. We absolutely loved the movie "Finding Nemo". The very brief class exploration and score was touching. We would have liked to see more of the beauty and mystery of this undersea world from the eyes of the field trip director for another 5 or 10 minutes. A Nemo 2 field trip maybe? Only this time Nemo saves the oceans. Just a fascinated group of family reunion planners. Thanks for "Putting Some Love In It." We grew up reading Charlie Brown books. Loved them. Could not get enough of them. The Sunday comics feature was just a teaser. The books kept us reading and chuckling for hours. We were so inspired by the antics and thoughts of the Peanuts gang that our vocabulary improved exponentially, thanks to Linus proverbial input. With Schroeder's help some went on to develop a love of the arts. One past-time was drawing the characters, which led to an interest in cartooning. Regarding family business and good work ethics, the lemonade stand helped. It led to another member pursuing a successful portraiture business. Snoopy was the dog we never had. Each character was and is an extension of the family and neighborhood. From a group of reminiscent family reunion planners. Now's the time to wrap up ordering your family reunion t-shirts, completing party favors and acquiring supplies. To get a list of all that may be needed consult the Budget Estimator found in Fimark's Family Reunion Planner Social web app. See my profile for more information. https://plus.google.com/100938838807003537301/about. Promote this blog in your circles and get the reunion event planning eBook for free. This weekend Brenda and I entertained our one and only granddaughter, KK. Since the beginning KK and Brenda were the very best of friends and for awhile I have to admit I felt a bit of an outcast. You know the feeling. Like being on the outside, on a frigid day, looking in. Brenda and KK have an unspoken language, energy and shared understanding of their girly girl universe that I simply know nothing about. That said, KK just did not quite know I fit in her world. Well, you know what they say, If it's cold inside, turn the heat up. So I did just that. I made a slideshow of KK from birth. We both made a big muppet style hand puppet together. We baked cookies together and I let her play my keyboard. Knowing that she loves to talk on the cell phone, sing and play along with nursery rhymes on my keyboard, I composed a jazzy version of her favorite nursery rhyme songs and called it KK's Nursery Room, which I recorded and Brenda sent to her via cell phone. She called back saying she loved the song and over a short period of time an unconditional affection grew. Five things made this visit particularly special for me. First of all, although KK seems to personally own just about every stuffed animal and doll ever made, she favors the puppet we both made together over most of her other stuffed friends. The third took place Saturday morning when I was trying to catch a few more winks before rising and starting the day. I felt a small thud and peculiar presence on my pillow breathing gently on my nose. After I managed to open one eye I saw the welcomed intruder eagerly smiling back at me. "Good Morning. 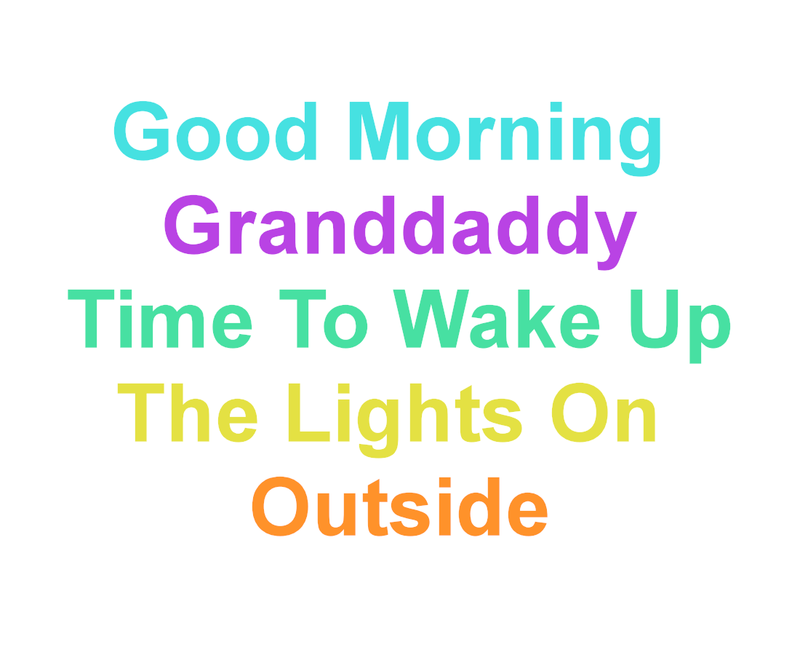 Wake up granddad," she said. "The lights on outside." Could any moment be sweeter than that? The rest of the day went much the same way as it began. She put me in a head lock and when I asked her why she was clinging, she said without hesitation, "Because I love you granddaddy." She certainly has her own way of expressing it. But I'll take what I can get. A few hours later I hear my two crazy girls burst into laughter following a big gold medal burp belted out by MaMarie. After KK had a good belly laugh over the whole thing, she then repeated the burping incident and laughed again and again. Another incident that made this weekend visit particularly special is the fact that she finally became friends with our house cat, scamper. Scamper prides herself on being the center of attention which is slightly diminished when KK comes to visit. Needless to say this shifting of attention usually toys with her esteem. But not this time. KK learned how to rub Scamper's head just the way she likes it. From that moment on they became best bed buddies. When KK jumps on the bed Scamper remains and even trys to share in some of the fun. Last but not least, our granddaughter was dubbed KK by yours truly. I always thought is was a grandparent's prerogative to call one's grandchild whatever he or she deemed appropriate and KK just seemed right for me. Well on the final day of her weekend visit we called her Kaylah. Quickly we were corrected. "My name is KK", she exclaimed. Not only has she accepted her nick-name, she insisted on being called KK from that moment on. The slideshow included the many trips we took to the park playing on the swings and blowing bubbles. Well, I guess you know the rest of the story. The fact is KK loved her granddad all along. She just needed to see, hear and relive the many memories we made together in order to truly appreciate her place in my world. KK and her cousin Mekaylah both have vibrant personalities. They are old souls and are fast learners. They will likely be the center of our next family reunions for years to come. The stories we'll tell about their antics and attainments will keep us all enthralled and entertained for hours. Not to mention the slideshows we'll show, songs they'll sing and stories we'll tell while watching them grow. The photos we will take and the family mementos we will craft. This will be a reunion like no other and Fimark's Family Reunion Planner Social web app will help us put it all together. Happy family reunion planning to you and yours. Get great ideas for your next family reunion using your family reunion planner web app. Don't have Fimark's Family Reunion Planner Social web app? Was $49. Now $39 for a limited time. Get 20% off. See my Profile for more information. Labels: family crafts, family entertainment, family mementos, grandchild, I love you, keepsake memory books, making family reunion slideshows, story telling.